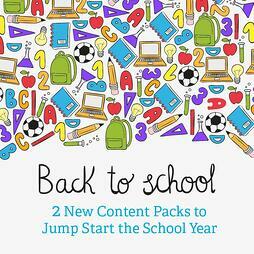 Back to School Content Packs You Cannot Miss! You can feel the pull of Back to School as the summer vacation wraps up and the pencil boxes and glue sticks start lining store shelves. We know that getting ready for a new school year is more complicated for educators than just stocking up on supplies. That’s why we’ve developed some great content you can use to kick off the year with fun. We have two great content packs to help your students jump into school year 2015-2016. This Back to School Pack features calendars, morning meeting activities, attendance charts, seating charts, daily graphing activities, and more. It’s filled with everything you need to begin the school year. New this year is a wide format 12-month calendar and mixed morning meeting pages for use with the MimioDisplay™ touch display, or for those who just prefer a wide layout. You'll definitely want to check it out! When using the pack, you can choose from completed lessons or use the large selection of images and templates to easily customize the activities. You and your students will enjoy this calendar and morning meeting pack – it’s all set to use for daily practice and reinforcement of skills taught. Students can practice skills using the featured calendars, morning meeting activities, attendance chart, daily graphing activity, math activities, and more. Feel free to use it as is, or switch out pages with templates and images provided in the NEW Back to School Gallery Pack 2105-16. New this year: calendars and morning meeting in regular and wide format. Just pick the one that works best for you! All of this content and much more is available on mimioconnect.com, the Mimio educator online community. It’s a great place for getting lessons, finding answers to tech questions, and connecting with other educators for sharing and inspiration. MimioConnect membership is completely free. To register, simply visit mimioconnect.com/user/register. Once you have experienced this amazing resource, be sure to share the news with other teachers in your school. The MimioConnect teaching community is the best way to get ready for the upcoming school year and beyond.